I’m four for four on tearing during childbirth, much to my dismay. For number four, my goals were three-fold: to have a more peaceful birth, to lock the image of seeing my baby for the first time in my memory (I think because of all that adrenaline, I can’t picture that moment for numbers two and three!! ), and to avoid tearing so recovery would be a piece of cake. I got about one-and-a-half out of three. Eh. I guess it was “more” peaceful. But I’m not sure if “peaceful” remains a word I’d use on purpose to describe childbirth. Perhaps it was an ill-fitted goal. And as for tearing…see the top of the post. Darn! We went for a hands-and-knees delivery in the water, but to no avail. I had so many “to do list” items for “before baby comes,” it felt insane. I wanted to clean the house, switch out kids’ seasonal clothing, get things ready for baby, of course, and go through the prep list the midwife gave us, plus plenty of online “work” items. Thankfully, it turned out that this one was quick and painless. A five minute job! When in the hospital, the nurses often give new moms a diaper stuffed with ice cubes to sit on right after birth and the next day. The ice reduces swelling and provides some pain relief and the diaper soaks up the melted water. I found these pads to be nearly as cold, more comfortable to sit on and with the added benefit of healing witch hazel for the stitches. Open the pads and lay them flat on the counter. Squirt some witch hazel on top, a few layers. I probably used half the bottle for 6 ice pack pads. After birth, if you have any tearing, stitches, swelling or discomfort “down there” simply pull one out and put it over your normal pad. Sit on it until it’s thawed completely. Note: Even without another pad or incontinence underwear, both of which are great for postpartum mess control, these pads never “leaked” or let any of the water out as they thawed. The witch hazel does not sting the torn skin. 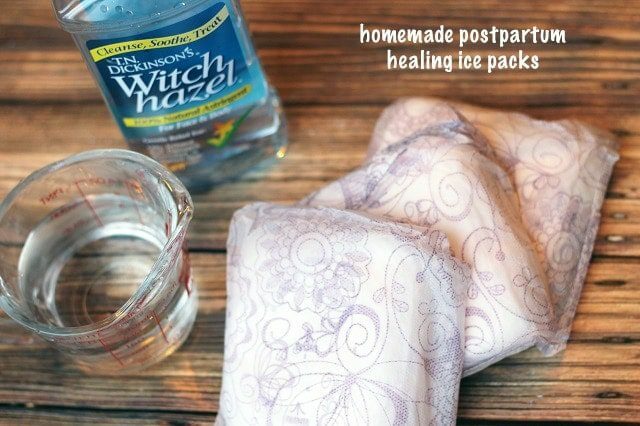 If you happen to know a bit more about herbs than I do, I’m sure there are some other herbs or oils one could add to this pad or infuse into the witch hazel for healing the stitches. Just make sure you know what you’re doing because it will directly touch open wounds. 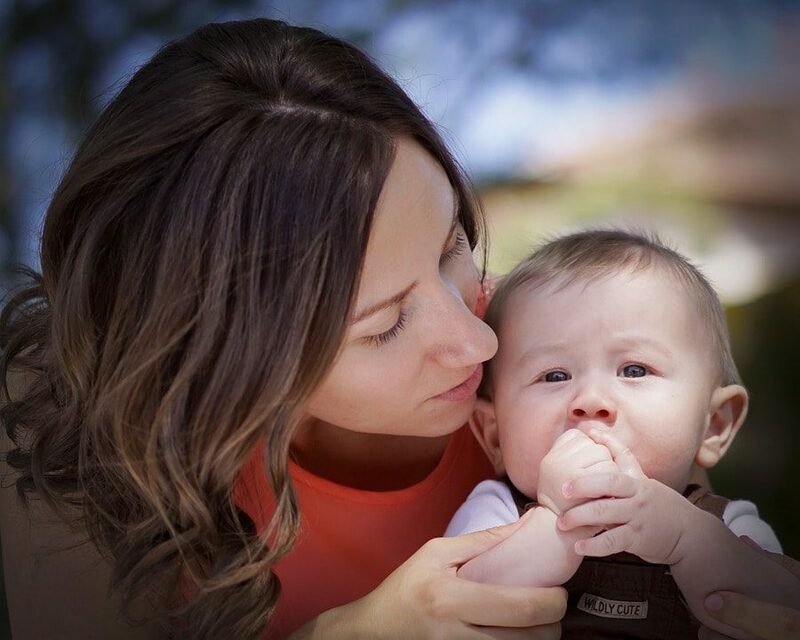 Here are a few other natural postpartum pain management strategies. What do you do to keep the postpartum time natural or DIY? I have to mention that some people are allergic to witch hazel or can develop an allergy after using a lot of it on broken skin. This happened to me–miserable, crusty rash!! It would be awful to experience that on the most delicate parts of your body while caring for a new baby. So, I’d advise moms considering this treatment to test witch hazel in advance, on a cut or scrape on some other body part. Personally, I didn’t like the frozen pad my midwife put on me after the birth. It did help to numb the area, but it also felt weird and made me cold overall. To each her own! Oof, that doesn’t sound fun at ALL! Very good advice! I have allergies to something in the ‘pads’. Instead try a nice cotton cloth soaked in the mixture then kept in the fridge, or freezer make sure it is well marked for mommy. I used these with my last two babies and they were awesome!! When I had tearing my midwife mixed up aloe and myrrh and spread it on the pad. That worked really well! Putting warm water in a squirt bottle and washing the area several times a day, as part of trips to the bathroom. Then icing in between. I healed quickly just doing these things. Great, simple idea – I’m totally going to prepare these! Thanks for sharing.